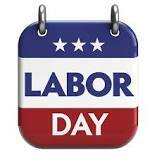 Happy Labor Day Week-End and Safe Driving! The New York Car Accidents Attorneys at Gair, Gair, Conasaon, Rubinowitz, Bloom, Hershenhorn, Steigman & Mackauf wish you all a wonderful Labor Day Week-End! Please be safe on the road as unfortunately there are 11% more accidents on the road during the Labor Day week-end than during a regular week-end. The National Safety Council estimates that 421 people will be killed in car accidents this Labor Day week-end. Additionally the NSC estimates that 48,400 road users will suffer personal injury requiring medical attention during the same time. These predictions are the highest that the NSC ever issued for the 3 day Labor Day week-end since 2008. Please stay safe and do not text and drive.